To our mind Boxcutter has always worked at the more interesting end of dubstep, on the one hand we have the nu-rave jump up rubbish that seems be delivered each week in inexhaustible amounts, while on the other hand we have a handful of acts that seem to thrive on confounding expectations rather than fitting into a mould. Boxcutter is one such artist and his second album 'Glyphic' is a testament to this, containing a cross-generic spread of tracks you'd never expect to hear from most producers on the scene. Of course there are likely to be those who moan at Boxcutter's lack of purist ideals, but what do they know? Here we've got rumbling bass one minute and an analogue synth freak-out the next, with a bit of two step and jungle thrown in there for good measure. 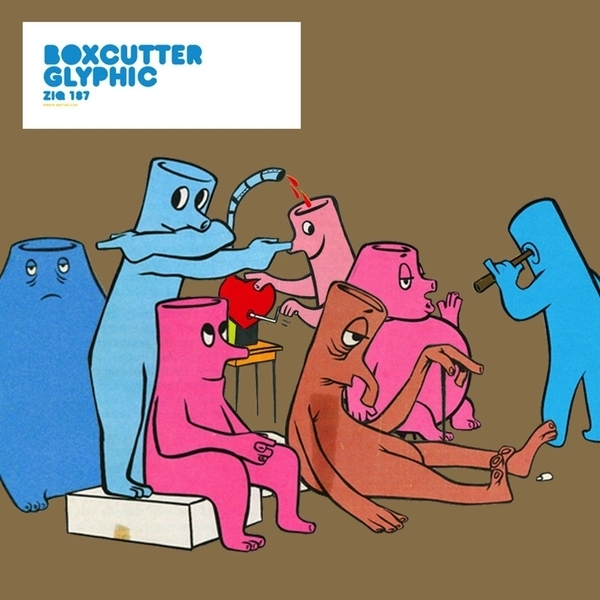 Boxcutter (Barry to his mates) is someone who isn't afraid to think outside the box when it comes to lapping up his listening material, and with a genuine passion for electronica, dub, jazz and, well, pretty much everything in-between I suppose we were always going to end up with quite an odd album. The fact that we kick off with something quite so unusual as the title track 'Glyphic' - an eight minute exploration into free jazz sax and deep, deep bass - only puts paid to these suggestions. Elsewhere we get the purist dubstep of 'Bug Octet', the breaks-heavy 'Rusty Break' and the crackling roots of 'J Dub', but for me the surprise highlight comes on the second half of the album which sees Boxcutter tackling squelchy analogue electronica. On 'Bloscid' we see the producer taking influence from Aphex Twin and Luke Vibert as he lets the drum machine cycle and the synthesizers blurt out hooky basslines and detuned lead, a style that pops back on 'Lunal' and for my money he's taking on the big producers and coming out on top. 'Glyphic' is a great dubstep album that manages to kick the spotty arse off a genre and shows the world that there's more to life than a rave sample and a comedy bass line. Let's hope he gets the credit he deserves.